Shopping for softball trading pins? We’ve got you covered with the best styles, designs and options you’ll find anywhere! TradingPinsDirect is your one-stop source for terrific pins that every other team at the tourney will be begging to trade for. We offer a wide range of options, sizes and styles to fit any design, any budget. We won’t be undersold on price. Our super-talented artists have been creating great pins for more than a decade, and we back everything we sell with our 100% Satisfaction Guarantee. 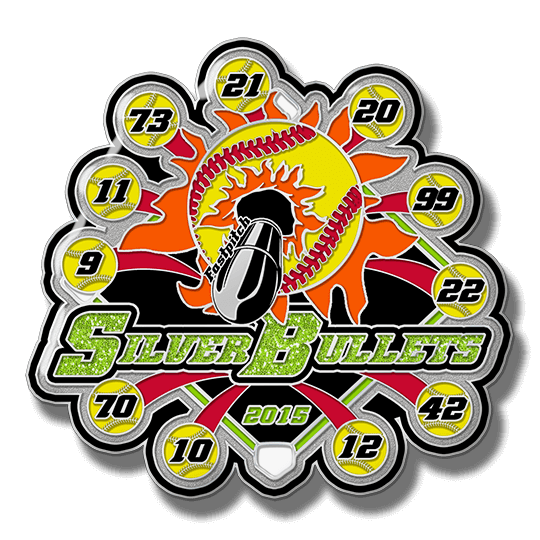 Let TradingPinsDirect make your team a winner when it comes to softball trading pins! Want to know more? Just fill out our no-obligation Free Quote form. We’ll send you a free digital proof of your design within 24 hours! Click below to see how easy it is to order great custom pins! 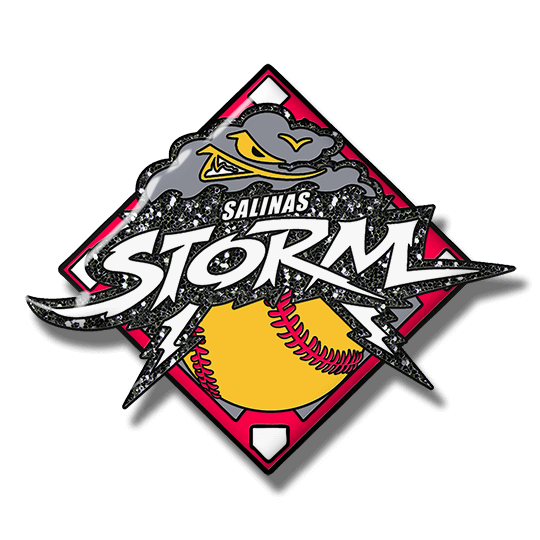 What could be more fun than swapping your favorite softball trading pins? What could be more fun than swapping your favorite softball trading pins? 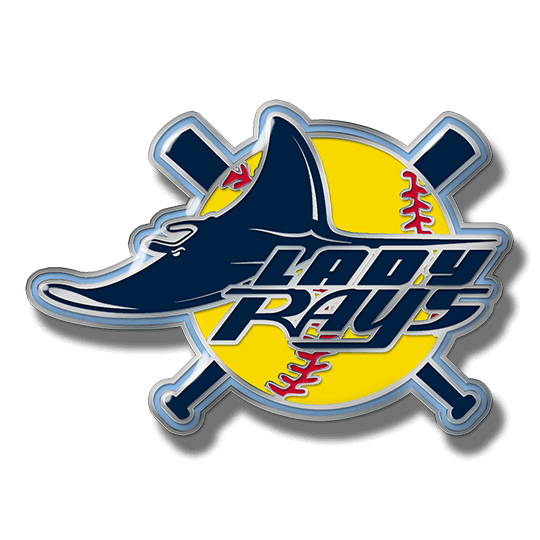 They’re a staple at softball games and tournaments throughout the season. Players, fans, coaches, officials and parents all love to trade pins. They help foster friendship and camaraderie through youth sports. And they make great souvenirs. They’re fun to wear, collect and treasure for a lifetime. We’ve been in the business of producing terrific trading pins for teams and groups all over the world since 2004. Our talented graphic artists have the experience you want in trading pin design. We know what it takes to make your team’s pins look great, trade well and meet your budget. And we know what it takes to keep our customers coming back year after year. Over more than a decade, we’ve learned what it takes to make great looking trading pins and what they need to maximize their trading value. We’re happy to share our expertise to make your team or group's trading pins the one that other teams will be practically begging to trade for at the big tournament. We specialize in three things: quality, value and service. We offer only the best quality materials and workmanship for your pins. You can rest assured they’ll be the best you can get anywhere. But that doesn’t mean we’re more expensive! We will not be undersold on price. We can create fantastic custom trading pins for your team, no matter what your budget. Last but not least, we treat every customer the way we want to be treated ourselves. We back everything we sell with our 100% Satisfaction Guarantee. If there’s anything defective about any pin we sell, we’ll replace it free. The bottom line is simple — we’re not satisfied with your order until you are. We offer a choice of pin styles. Soft enamel is the classic trading pin, our most popular seller. This timeless style uses special enamel paint in a die-struck design to create a bold, colorful, dynamic look that traders love. Photo etched pins use a chemical etching process rather than die-struck designs to create a design that can include fine lines and intricate details that soft enamel can’t achieve. This is great for highly detailed designs. Full color trading pins use an offset digital printing process that allows your design to include photographs, fine details and specific logos. Like the photo etched style, these require a clear epoxy coating applied over the design to protect it from scratches and scuffs. We apply this special finish at the factory at no extra cost to you. The key to the trading power of your trading pins is the design itself. We offer a full range of pin sizes, and add-ons that can boost the trade value of your pins, but don’t forget that a great design can be any size, and can need few, if any options. Our graphic artists will be glad to work with you to create a memorable design that’s sure to win attention for your pins. Having said that, well-considered options can add considerable value to your trading pins, and can do so without blowing your pin budget. Glitter enamel, for example, is our most popular add-on, and quite economical. It adds a richness and depth to your design that helps your pins catch the eyes of traders. Danglers are a great way to personalize your team’s pins, allowing you to add a year, tournament date or even a player’s name to the pins. These can be updated in succeeding years as well. Spinners boost trading value by adding an eye-catching motion element to your pins, and a fun “play” factor as well. Bats, balls, gloves, footballs, soccer balls, basketballs, skates and hockey sticks can make your team’s pins more fun to have and to trade for. LED lights are a terrific way to add a surprise to your team’s trading pins. Give your team mascot flashing eyes, and you’ll be sure to get the attention of potential traders! Sliders add motion and fun as well. A player leaping for a ball, for example, can slide along a track in the main trading pin. This adds to the desirability of your pins once the trading starts. Bobbleheads add extreme trading power to your pins. These are mounted on a spring attached to the main pin, and move independently with motion. They are among the most sought-after options that send the trade value of your trading pins into the stratosphere! When you’re ready to order your team’s pins, we make it easy at TradingPinsDirect too. Just fill out our no-obligation free quote form or call us toll-free at 866.860.8842. We’ll respond with the best customer service you’ve ever seen! We’ll send you a free digital proof of your design that you can revise as much as you like until it’s exactly what you want. Remember, we never charge for artwork or revisions. One thing to keep in mind when ordering is that it’s always better to place your order early in the season. Every trading pin manufacturer around the world is swamped with orders in June and July. If you wait until then to order, we can’t guarantee a specific delivery date, and your order will likely take longer than if you order in April or May. If, however, you learn late that your team made the tournament, don’t panic. Your players don’t have to be left out of the fun once the pin trading starts. We have a range of stock trading pins that we can quick-ship. They won’t be personalized specifically for your team, but they’ll be attractive pins that your players can trade with other teams. Once you place your order, we’ll ship it to any address in the continental United States at no extra charge. Free shipping is always a part of the way we do business. As noted above, we also back every order of trading pins with our 100% Satisfaction Guarantee. We want you to be happy with your order. To ensure that you are, we’ll replace, at no extra cost to you, any pin found to be defective in either materials or workmanship. We don’t want just one order from you. We want you to be a satisfied customer for life! We’ll do what it takes to make that happen. If you’re ready to order your team’s trading pins, contact us, either through our no-obligation free quote form or by phone, and we’ll be happy to show you why TradingPinsDirect is your best source for trading pins. Let us show you what we mean when we say we have the best products, the best prices and the best people. We’re here to serve all your trading pin needs, now and in the future! Ordering your trading pins from us couldn’t be easier! With our fast, friendly, fun process, you’ll have exactly the pins you want faster than you ever thought possible! Choose a style from our great selection. We have one that’s perfect for every team and every budget! Once you fill out our no-obligation free quote form, we’ll respond fast with a FREE digital proof of your pin design. Once you’re satisfied with your pin design, confirm your order. Our FREE shipping will get your pins to you fast, anywhere in the continental U.S.A.! Great! Head on over to our free quote page, call us toll-free at (866) 860-8842, or email us at [email protected] and one of our friendly, knowledgeable customer service representatives will be happy to prepare a no-obligation free quote for you!